Spooking is one of the illegal ways to cheat at blackjack and find out about the cards of your rival. This kind of cheating has changed a little bit lately though the old way of it is also possible to observe today. Spooking was actually a dealer’s way to cheat blackjack first. After giving a player the first card and seeing that this card was of 10 points or an Ace, a dealer tried to peek under the second card in order to find out whether the player would have blackjack or not. If so, this dealer turned up the card and stopped the game immediately without playing any hands. Later, blackjack cheaters tried to outwit a dealer and began to work in groups. One of them stayed behind a dealer and was able to see what card would be the next. After that he gave a sign to his “colleagues”. The person who stood behind a dealer or sat at other table to be able to see a dealer’s cards was called a spook. Spooking – the act of standing behind a dealer, peeking under his hole card and giving the information to a partner who sits at the table and actually plays with a dealer. 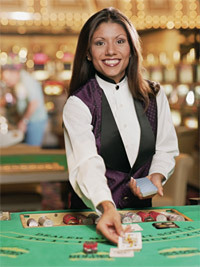 A spook – a team member who stands behind a dealer’s back and peeks under his cards with further giving of information to his partner at the blackjack table. Well, the negative side of spooking is the need to share a winning with all your partners. So, your craving for money will not be satisfied if you practice this.